Whenever I get home from work I like to have a satisfying snack waiting for me. My freezer is usually stocked with energy bites, frozen pancakes, nuts, and dark chocolate at all times. Every once in awhile I’ll go the extra mile and make a snack that feels more like a delicious and satisfying dessert. Because who doesn’t want dessert after a long day of work, right? 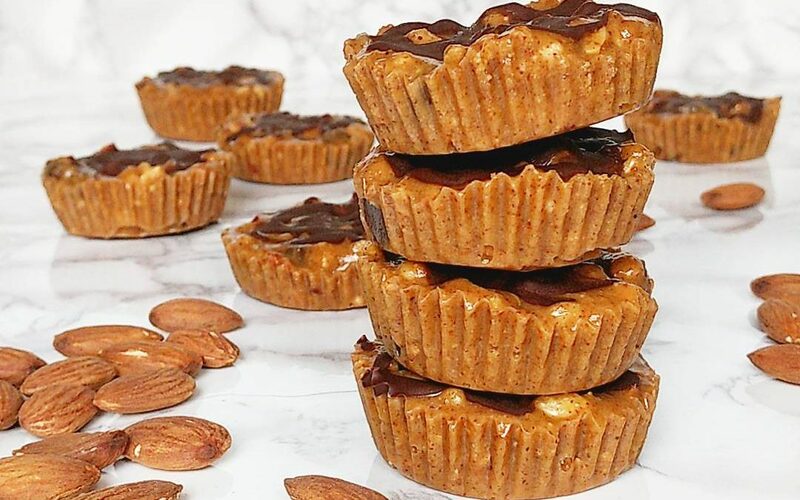 Cue FUDGY CRUNCHY ALMOND CUPS! It melts in your mouth while simultaneously giving you a perfect crunch. Texture is on point with this one. Or do we say “on fleek” these days? Whatever. It’s good is what I’m saying. Deeeelish! This was originally my go-to recipe for Almond Fudge Bars which were always super easy to make. Literally 5 minutes. All I really did was add some chopped nuts, rice crispies, and chocolate chips for that added crunchiness. Wise decision indeed. These treats are chock full of healthy fats, fiber, and antioxidants. A quick note on fats – in case you are worried… fat won’t make you fat! Healthy fat from sources such as nuts, fish, and most oils (such as olive, avocado, and flaxseed oils) actually can help you burn fat and keeps you satisfied. Fats are needed for important bodily functions such as proper hormonal function, body temperature regulation, brain function, organ protection, and cell regulation. Bottom line… Your body NEEDS some of that fat to work at it’s best. Also, as with everything, it’s really about portion control and balance. Which is why I like that these are individually portioned into single serving cups. Basically… you can now make these individually served treats knowing you are also nourishing your body with all that good fat! And did I mention how easy and quick they are to make? So. Easy. Get on it! In a bowl mix together until well blended: almond butter, coconut oil or cacao butter, maple syrup, and vanilla extract. Add rice crispies, almonds, and chocolate chips. Stir until everything is coated and well combined. Using a small cookie scooper, scoop mixture into lined 12 cup cupcake pan. The mixture will fill up the cups about ½ way. Drizzle each cup with some melted chocolate and swirl it using a toothpick. Place in freezer for at least 20 minutes. Enjoy! Store in the freezer. *I like to use melted cacao butter but if you don’t have any, that’s okay. If you don’t mind the added coconut flavor then coconut oil works wonderfully in this recipe.